As the evening chill starts to creep up on me in the evenings, and I find myself throwing a blanket over my shoulders or wrapping a sweater around me… I realize summer is soon coming to a close. In honour of summer, and due to the fact that I’ve not in the slightest way caught a tan this year: my next couple of posts will be celebrating the sunshine, and that means (of course) celebrating the vibrant produce that summer provides us, as these items go slinking off into the distance… and out of season. 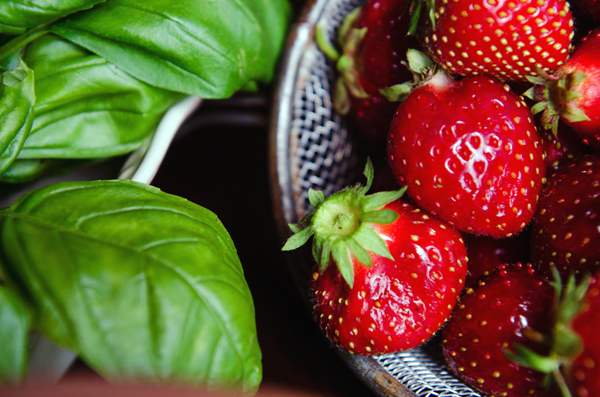 What could be more summery than watermelon, strawberries, and basil? Not much really. Especially here in Ontario where berry picking is many people’s favourite lazy-Sunday activity. This dish is actually the perfect way to use up any kind of berries, anything you have kicking around your kitchen or freezer from the season. Maybe you have some berries that are about to kick the bucket and aren’t looking too good anymore. The kind of strawberries that are starting to look sad and wilty, and have soft spots on them- these are the perfect victim. They don’t look nice anymore but the flavour is at it’s prime. This is a dessert I created last year in my previous job, right in the height of hot-season in Florida. There’s nothing more refreshing in the dead of summer and it’s humidity than the lightness of chilled fruit. The basil gives it a nice edge, and I find that it works in the same way we use salt or lemon: the slight infusion seems to enhance the flavours of the other main ingredients, without completely overpowering. This particular basil pictured actually came from the garden outside, fresh from the earth! -This recipe has been converted from a professional kitchen where an ice cream machine is used, for the home cook who isn’t blessed with this equipment! Your homemade sorbet will not the the same exact silky texture as the one pictured, but if you have a hand blender or regular blender you can process this mixture to get the smoothest product. -Place all ingredients in a pot and warm to a slight simmer just to dissolve all ingredients together. At this point: either whisk the mixture, or if you have any sort of blender; blend it at this stage. Make sure you get a nice frothy texture, and then transfer the mix to a freezer-safe container and allow to freeze for 30-45 mins. 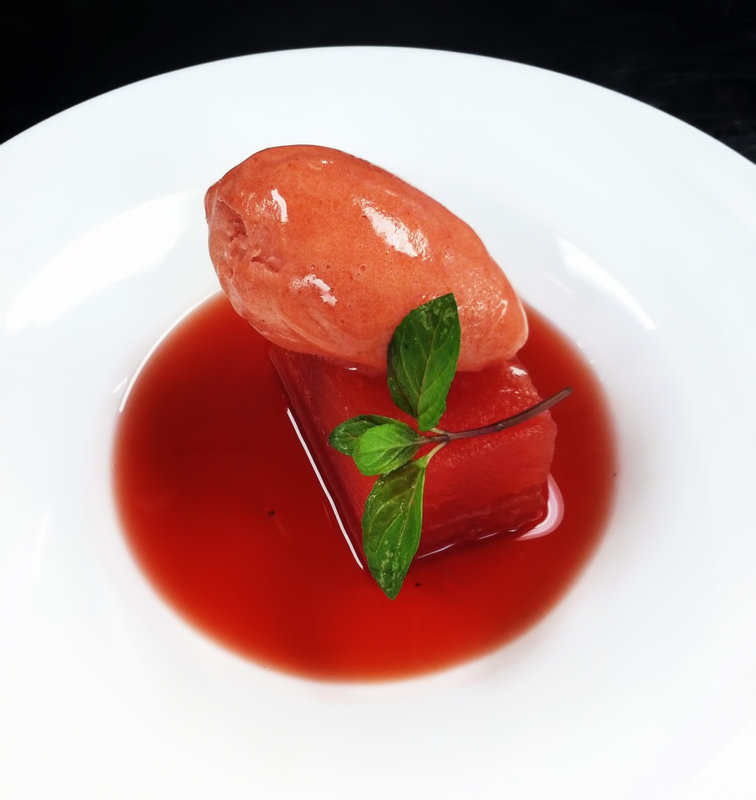 -Continue to do this until the sorbet is completely frozen and scoop-able, and reserve for later. 1 pkg of fresh of basil. -Cut watermelon into rectangles of even thickness, wrap entire surface of watermelon with fresh basil leaves, and place the bricks inside a vacuum-pack bag. -Vacuum the bag shut using the highest setting on your vac machine (for best results/infusion of flavour) and allow to sit overnight in the fridge. -In the morning discard the basil leaves and set the watermelon aside. -Toss strawberries with the sugar, place in a small steel bowl, cover tightly with plastic wrap. -Place steel bowl over bain-marie (pot of simmering water), and allow to sit this way for approx 20-30 mins, or until all the juices have seeped from the strawberries. -Be sure you put enough water in the pot so that it doesn’t dry out and burn on you! Check it often, but do not remove the plastic wrap until the strawberries are sitting in a decent amount of liquid. -Pour strawberry mixture into a fine mesh strainer and allow to drain for a few minutes without pressing. This will allow the soup to strain and the tiny berry seeds will not come through the mesh, leaving the liquid perfectly clear. Add a small squeeze of lemon juice if you find the soup too sweet, and reserve in the fridge. Of course, you can make a spin off of this dessert with a multitude of fruits, whichever you prefer. Melon works best for vacuum packaging, as other fruits don’t have the right textural makeup to withstand the compression. Melon becomes an even better version of it’s former self through this process, or at least I think so. It’s colour also becomes even more vibrant and intense. Visually and texturally- this is a fun project. And easy, as I like to keep it simple! Always. To view watermelon compression in step by step form, and to view the melon’s “before and after”, visit this site. Tomorrow’s celebratory summer post will be… sweet corn cake with blueberry frozen yogurt.